The Palmer’s Peculiarities ‘Peculiarity No 1’ Beard Oil has an incredible scent and the oil has left my beard feeling and looking good! Palmer’s Peculiarities are based in East London and owner and creator Alison Palmer hand makes small batch, all natural and vegan friendly beard care products. I have tested two scents from the range in the balm and the oil and the Peculiarity No 1 beard oil is the last of the products from the brand. Like all of the Palmer’s Peculiarity oils it has a base of JojobaOil, Grapeseed Oil, Tea Tree Oil & Vitamin E and yes I have put Tea Tree in as part of the base as Alison uses Tea Tree in all of her products for its antibacterial properties. This blend of natural oils has left my beard feeling nice and soft and looking good. The scent for the Peculiarity No 1 is a blend of Bergamot,Patchouli, Cedar, Black Pepper & Lime and oh wow! It is fresh, earthy and citrus and it really works for me, the scent also lasts on the beard which is always a bonus! 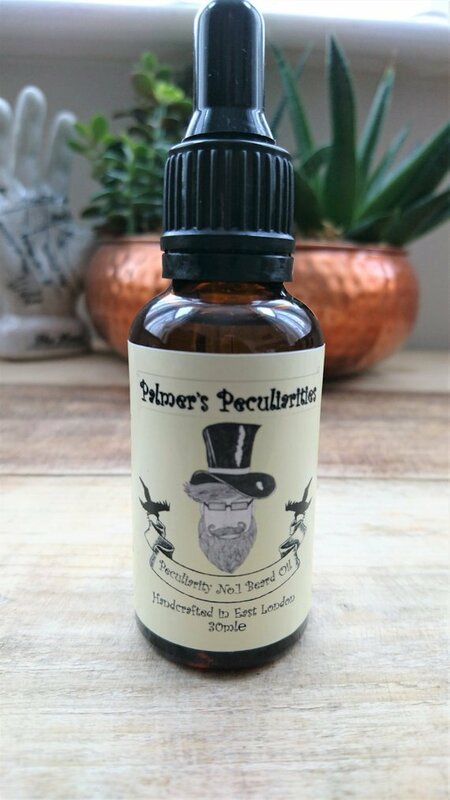 The Palmer’s Peculiarities ‘Peculiarity No 1’ beard oil comes in a 30ml glass bottle with a glass dropper to dispense the oil and costs £12.99 from the website.